Amidst the urban jungle, every once in a while a reminder of the real jungle pops through. There are a few gorgeous trees that speak to me as I flâne (stroll) around the city. One of them may well be the most beautiful tree I've ever seen in my life, let alone Paris. But first, some of the runners up, such as this breath of fresh air (literally) that pops out at the beginning of spring -- just when you need it most -- among the Haussmanian buildings and 19th century Eglise de la Sainte-Trinité in the 9th arrondissement. After the longest, drabbest Parisian winter I can remember (clearly, the November terrorist attacks did not help the general gloom and grayness we all felt), it's finally spring, and the trees are blooming. All I want to do is walk around the city without a jacket and gape. The trees by the Seine are also particularly spectacular in the fall. In the Jardin des Luxembourg, there are a few contenders for the most interesting, or geometric, trees, if not the most beautiful. This palm tree seems like it should be too big for its planter box. 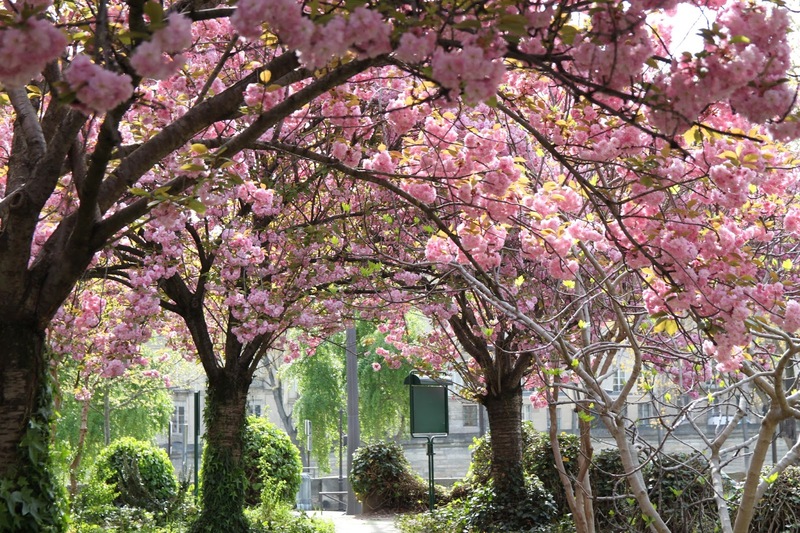 But for one week -- this week -- and one week only when it's springtime in Paris, we get to see the top contenders for the Most Beautiful Tree in Paris -- the white and pink flowering ornamental cherry and plum trees in the Jardin des Plantes. Every time I walk down a new path, there's a new most-beautiful tree. It's no surprise then that the winner, in my mind, of the Most Beautiful Tree in Paris title is found in the Jardin des Plantes, an ornamental flowering Japanese tree, genus Prunus, Groupe Sato-zakura, "Shirotae". It's an ethereal beauty -- in perfect bloom only for a few days per year (even fewer than all the other cherry trees) and an impossible, horizontal shape. This year, our family times it just right and, along with the other lucky park visitors, we are awed. People are magnetically drawn to it, and then sucked right in, since there's room to climb under the canopy that drapes right down to the ground. Inside, you're surrounded by a cloud of fluffy white blossoms (and about a thousand bees, who are, fortunately, more interested in the blossoms than in human flesh). Tomme Acajou au Lait de Salers means, literally Mahogany Cheese Wheel made with Salers Milk. It is, indeed, as the name suggests, made from Salers milk, that is to say, raw cows' milk from the Salers breed of cow, the same breed that gives Salers cheese its name. Like a Salers, this Tomme Acajou is made in Cantal, in the Auvergne-Rhône-Alpes region in southern central France, in the Massif Central (mountainous area). There's also another famous cheese made here called, aptly, Cantal. Basically, Tomme Acajou is a cheese you've never heard of and will likely never encounter (unless you have your ins at the farm in Cantal or time it just right at a Laurent Dubois fromagerie in Paris) that would remind you, if you could get your hands and mouth on it, of Salers and Cantal. Like its more famous cousins, this is a hard, aged cheese. The crust is really something spectacular. From the outside, you'd swear you were looking at a thousand year old stone. An no, it's not really: it's aged, but not that aged. I'm not sure if it's name for the texture (kind of woody, though I'd say more stony) or the color, which is in the mahogany family -- hints of deep reddish-brown. 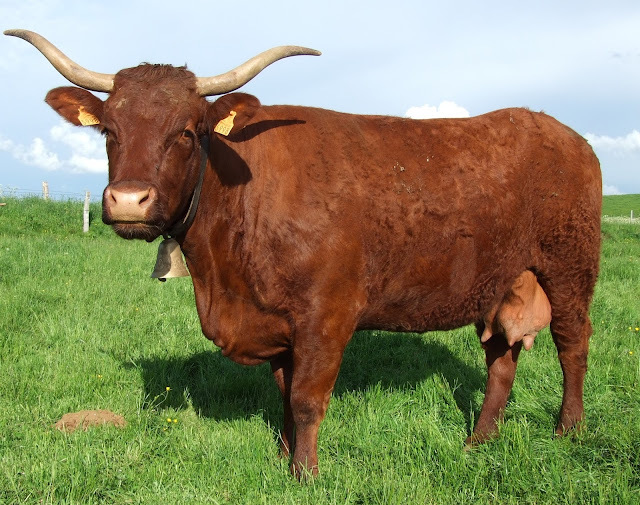 But most likely, I suspect it's named after the color of the Salers cows, which are most definitely mahogany-colored. Even from the inside, the cheese's crust is a really defining characteristic. Just look at how the crunchy crust is creeping into the creamy crevices. (I'm sorry, I couldn't resist the alliteration.) When you eat one, it's like a little dry nugget candy to chew on. I'm sure many people are cutting off the daunting crust in order to eat the cheese. What a shame. To me, it's the most interesting part! Tomme Acajou has the simple, slightly nutty-fruity flavor of a classic high altitude cow cheese, but not an overpoweringly stinky one. I haven't seen any mahogany trees in Paris, but I must admit that I wouldn't recognize a mahogany tree unless it had a label on it, which is why I find furniture tags so helpful, and also the gardeners at the Jardin des Plantes who label things for me. Despite living in the urban jungle, I have seen many other beautiful trees in Paris, however. And so I am happy to find a beautiful cheese-named, tree-themed cheese, the Tomme Acajou au Lait de Salers, to go along with this story and these photos.